| Winter Wonderland is coming! 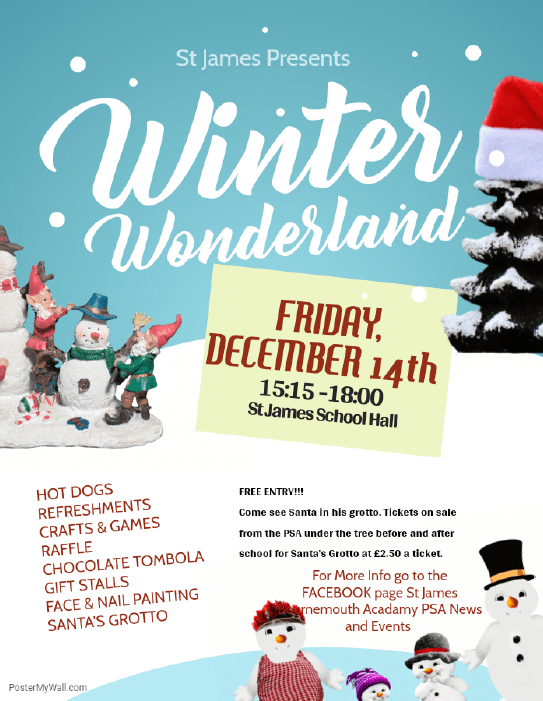 Please see the below poster regarding the amazing Winter Wonderland event being held straight after school on Friday 14th December. Please join us at school for games and refreshments (pizzas, hotdogs, sweet treats, and a bar) and of course don’t forget to book your ticket to see Santa in his grotto. (Tickets will be being sold under the tree at most morning and afternoon drop off and pick-ups, week commencing 10th December. Please see your reps to find out what stall your year group is running and please sign up to help out (even if it’s just for 30 minutes). Alternatively, please email Victoria at evolutionlets@aol.com or contact the PSA on the facebook group to sign up to helping out. Your help would be greatly appreciated. We will be needing a team to help decorate the grotto on the morning of Friday 14th December. Please come along. Any spare decorations anyone has to donate would be greatly appreciated and if people wouldn’t mind lending Christmas lights and decorations for the grotto, please drop them into the office asap so that the electricals can be tested and please clearly name your items. Face painters also needed. Please can you contact Victoria if you have these skills and can spare some time. Friday 14th December will also be a MUFTI DAY FOR A CHOCOLATE DONATION for the famous chocolate tombola stall.